A small, but mighty audience took in an enjoyable show from John Kirby and Blind Mule who were back in Lethbridge for the third time in a year, Oct. 29 at the Slice. John Kirby began with a heartfelt set of original folk/ rock tinged songs with a little help from Blind Mule vocalist/guitarist Graham Peaceful who added some tasteful leads. 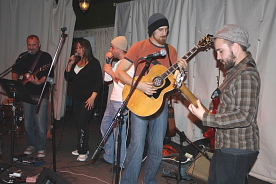 Hamilton folk/ country band Blind Mule played a couple sets, the first originals and the second full of unique interpretations of covers including “Blister in the Sun,” “Bad Moon Rising,” and “the Joker” which utilized one member beatboxing (making drum sounds with his voice). Their arrangements were different and added their own take on classic hits.